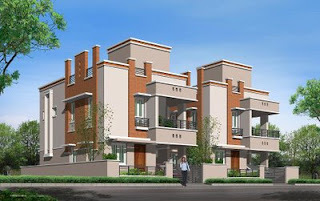 Doshi Housing is offering Independent Villas & Twin Houses at Santhoshpuram adjacent to its Doshi Trinity Park project. A total of about 48 residential units are planned to be constructed in G+1 floors. The units are available in sizes ranging from 1200 sqft to 2470 sqft (as on July 11, 2009) on land area ranging from 728 sqft to 1805 sqft. The total rate will be around 45 Lakhs and above. The project is expected to be completed by June 2010 (tentative).